In the dark dense rain forest of Chilean Patagonia, I am retracing the steps of Charles Darwin, in a search for the freak of a frog that bears his name. The charming quirk of Darwin’s Frog is the male’s proclivity for carrying tadpole eggs in his vocal sac before disgorging the tykes into the world. The frogs come in hues of brown to green, making the tiny creatures almost impossible to see in their swampy habitat. But Diego Stock, my exuberant Chilean guide, insists that he has spotted one hopping around this squishy bog a stone’s throw from the Pacific Ocean. It looks like a fluttering brown leaf, but as I bend closer, I catch the outline of one of the world’s most endangered species. Darwin, the 19th-century father of evolutionary theory, encountered the frog in his voyages around South America in the 1830s. Now, 180 years later, I have come to Patagonia to witness another evolution – not just in this embattled frog, but in the new concept of capitalist conservation. We are tramping through the forests around Melimoyu, a remote speck on the map 1,200 kilometres south of Santiago, Chile’s capital. It is a living laboratory of frogs, birds, trees, flowers, blue whales, penguins and a sea lion that plays hide and seek with our rafts and kayaks as we glide down the Marchant River. Just as Darwin’s voyage expanded the understanding of life, Patagonia, one of the last vast empty places, is a test site for grafting protection of natural lands on to profit-driven ecotourism and real estate. Melimoyu lies about halfway down the narrow ribbon of Chilean Patagonia, a region 1,800 kilometres long and fewer than 200 kilometres wide – from the Pacific to the Argentine border. Much of the land around Melimoyu is owned by Patagonia Sur, a company founded by U.S. social-media millionaire Warren Adams. It is one of his six Patagonian properties, comprising 25,000 hectares, spanning ocean rain forest, gaucho grasslands in deep Andean valleys, and majestic glaciers on the ragged edge of South America. So far, two of these properties, coastal Melimoyu and inland Valle California, contain small luxury resorts, and a third, Lago Espolon, has more Spartan hostel accommodation. “We are buying ecosystems under threat by development,” explains Adams, a Harvard MBA who sold his tech company to Amazon in 1998 for $100-million in shares. He was mesmerized by a trip to Patagonia with his wife, Megan, but he also observed a region that was in danger of a development landslide more transformative than any earthquake. It was poised to be overwhelmed by new roads, airstrips and potential transmission lines transporting power from planned hydro dams in the south. He set out to save space for creatures like Darwin’s Frog, whose numbers have been devastated by viruses. And on this day in early April, Stock, who oversees guiding at Melimoyu’s eco-resort, is encouraged by the discovery of even a single specimen. He records the sighting on a clipboard – grist for a research foundation set up by Adams to study the region’s flora and fauna. But make no mistake: Patagonia Sur (sur means south in Spanish) is a hard-nosed start-up in the tradition of the high-tech world where Adams earned his entrepreneurial stripes. It comprises a real-estate brokerage (catering to green-minded clientele), sustainable property development, carbon-offset trading and reforestation, as well as ecotourism targeted at affluent consumers who will spend $6,000 (U.S.) or more on a week that melds fly-fishing, sumptuous dining and a clear conscience. Adams’s idea is that ecologically based tourism and real estate are not just beneficiaries of conservation – they can be drivers of preservation. He aims to attract investors by the potential for healthy rates of return earned on Patagonia’s still relatively inexpensive land. The funds will underwrite the acquisition of more and more property, to be protected by tough land-use covenants in perpetuity. Adams could be building a model for saving other beautiful places – say, in rural Newfoundland, New Zealand or Africa. The old model was based on government-funded parks or non-profit groups wringing donations out of philanthropists. But Adams says there is only so much money available to non-profits – and governments are stretched. There is, however, a vast supply of profit-seeking investors – and adventure-seeking tourists. He has enlisted about 50 such investors, who have injected $23-million so far in his $30-million fund. This is not raw capitalism masquerading as do-goodism, he asserts. “Our capitalism-conservation is absolutely protecting places that wouldn’t be protected otherwise,” he says. At Melimoyu and its sister resort, Valle California, an Andean river-valley site about an hour by helicopter to the northeast, it’s as if Charles Darwin conspired with Ralph Lauren to create a vacation spot. After energetic walks through lush jungles and horseback rides along rugged buttes, we retire in tastefully appointed lodges with milk-washed walls and earth-toned decor accented with antique trunks and seashells. The iPod decks play Alison Krauss and Van Morrison as you indulge in a hot-tub soak and a constant stream of pisco sours, the tart South American libation. Over at Valle California, guests stay in cozy circular yurts with a comfort level not found in Mongolia. The roof point of each yurt is topped by a transparent covering that permits guests to lie back and catch a piece of the spectacular star show – although it is much better to step outside to get the full glory. The resorts, which at this point can each accommodate about a dozen people in total, also sport professional chefs and gourmet dining (think fresh-caught lightly seasoned abalone, platters of fresh fruit and vegetables, filet mignon, hearty caldo de congrio – the local eel soup delicacy, and, of course, fine Chilean wines), as well as helicopter rides to glaciers to drink scotch splashed over 3,000-year-old ice. I was looking around for the 3,000-year-old scotch, as well, but Johnny Walker filled the bill. Earlier this month, when I visited, Patagonia Sur stood at a turning point in its evolution. In its first three years, the business focused on selling lifetime club memberships to perennial visitors. Next year, sensing where the big demand lies, it will tilt toward vacationers who plan perhaps one lifetime visit to Patagonia, and fly under the name Patagonia Sur Wilderness Lodges. Though volatile weather is always a factor in these mountain and ocean settings, my voyage to Melimoyu was relatively easy – a two-hour flight from Santiago to Puerto Montt, a bustling salmon-fishing centre. I cooled my heels for a couple of hours before our pilot got the go-ahead for the final hour’s flight into Melimoyu. The Cessna cleared the clouds, providing stunning glimpses of Patagonian inlets and islands before alighting at an airstrip near the resort. After a couple of days of exploring the lush greenery in search of Darwin’s Frog and various bird species, I was whisked by helicopter up to Valle California, where I grasped the full potential of Patagonia Sur to deliver diverse ecosystems. I was soon riding high astride Matungo, a placid brown horse with a disconcerting habit of gobbling clumps of grass at every stop in the action. On a short ride across the pampas, we stopped at a vacant gaucho cabin that looked frozen in time, with dusty saddles, narrow cots and spectacular mountain views. At both Melimoyu and Valle California, the helicopter transported me high above the trees and rivers to massive glaciers nearby. The contrast with the rain forest below couldn’t be more pronounced than it is at Melimoyu’s volcanic peak, but nothing prepared me for the sheer wonder of the glacier near Valle California – the perfect turquoise lake below and the amazing moonscape above, with the glacier’s eerie crevices and giant folds of marshmallow ice. On the return trip from Valle California to Puerto Montt, there was a change of plans – related, I was told, to weather uncertainty. A journey that might have taken about three hours was expanded to almost six hours, including four hours by car. But even the hitches were interesting – in this case, a drive through the town of Chaiten, still rebuilding after being devastated by a volcano in 2008. The volcano, in fact, is still fuming on the horizon. That is what Warren Adams is offering – access to one of the last lonely wildernesses. If he has his way, it will become a little less lonely, but never so much to spoil the view. Getting there: Fly to Santiago, then take a local flight, typically two hours, to Puerto Montt. There, you board a plane chartered by Patagonia Sur for the hour flight – either to Melimoyu or Valle California. The package includes a helicopter or flight between the two locations, although it is possible to spend your holiday in one spot. But that would detract from the diversity of the experience. Where to stay: Each resort offers six ensuite bedrooms. Melimoyu has a hot tub with a fine view. Valle California has cushy yurts. The central dining lodge looks out on a breathtaking view. 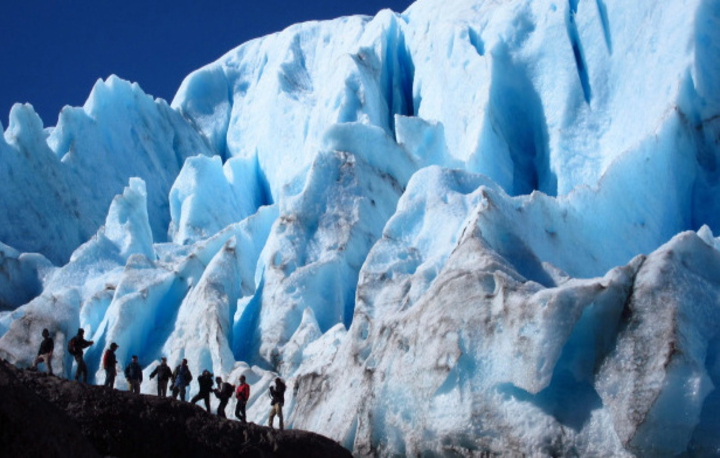 When to go: Patagonia Sur operates from early November to the end of April, with January to March as the peak time. That’s the high summer period when the blue whales can usually be viewed around Melimoyu Bay. April is also a nice time, as the trees turn red and yellow on the foothills and plains at Valle California – although the nights can be long and cool. The weeklong vacation package costs $7,725 (U.S.) a person (double occupancy), and includes charter flights to and from (as well as between) both luxury properties out of Puerto Montt, an hour-long helicopter trip to your desired remote location, meals and lodging. The Warren Adams concept of capitalist conservation is not the only model of sustainability showcased in Patagonia. Contrast the Adams approach with the vision of another U.S. entrepreneur Doug Tompkins, the founder of the North Face and Esprit clothing lines, and his wife, Kris, who once headed the outdoor apparel company called, yes, Patagonia. Over the past two decades, they have leveraged their fortunes, and those of allies, to develop nature preserves in Argentina and Chile that reflect pure conservation and pure philanthropy. “It is a different vision,” says Hernan Mladinic Alonso, executive director of the Tompkins’s Parque Pumalin foundation based in Puerto Varas, Chile. The Tompkins’s holdings consists of about 850,000 hectares in Chile and Argentina, including the 300,000-hectare Pumalin Park, the largest private land reserve in the world, a short distance from various Patagonia Sur properties. The virtue of the two models can be debated endlessly, but the winner is the traveller, who gets the choice of the purist Pumalin experience, with $3-a-night camping amid the Andes, and Patagonia Sur with its weeklong $7,725-a-person vacations that combine fine dining and nature walks. While ecotourism and real estate lie at the heart of the Patagonia Sur model, capitalism is purely incidental to what the Tompkins are trying to do. They expect much of the business activity for their parks will reside in the towns around them. Instead, Alonso says, Pumalin is “an environmental activism project,” with the goal of creating nature parks that will last forever.